A trendy color combo that has been popping up all over design magazines and television is black, white and a greenish yellow. Actually most any color that makes black and white pop is popular. Since I had some embossed black cards left from my first effort at the 4 Hearts card a few days ago, I thought I'd give this dressy cosmopolitan combo a go. 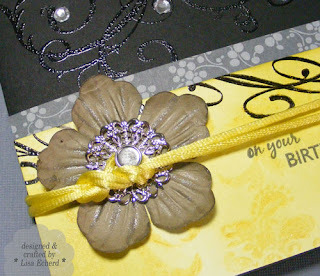 To get the greenish yellow paper, I started with white Stampin' Up! 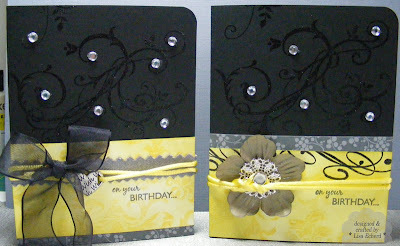 cardstock and stamped some damask images with YoYo Yellow craft ink and then embossed. I wasn't quite fast enough so some of the images didn't completely take the embossing powder adding to the distressed look. I sponged Kiwi Kiss over the images using the Tim Holtz distressing tool. One card has some further black embossed swirls. 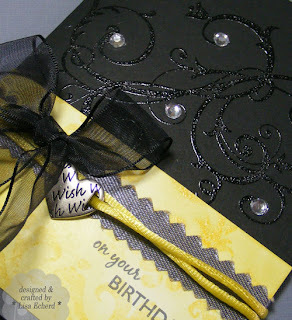 For the other card, I trimmed up a piece of discontnued gray sateen fabric. The yellow cord has been in my stash forever. I think it was part of a fabric store ribbon grab bag. I attempted some sort of fancy Chinese knot but after several ties, it looked a little lost on the card. A few more embellishments and the experiement was complete. One of these may be my Mom's birthday card in a couple of months. She is definitely a lady who suits this striking color combo. DSP: Urban Garden from SU! Ooooh, I love the colors!